454 pages | 60 B/W Illus. 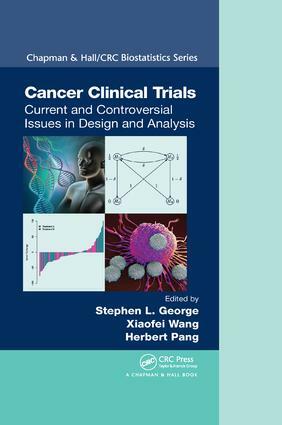 Cancer Clinical Trials: Current and Controversial Issues in Design and Analysis provides statisticians with an understanding of the critical challenges currently encountered in oncology trials. Well-known statisticians from academic institutions, regulatory and government agencies (such as the U.S. FDA and National Cancer Institute), and the pharmaceutical industry share their extensive experiences in cancer clinical trials and present examples taken from actual trials. The book covers topics that are often perplexing and sometimes controversial in cancer clinical trials. Most of the issues addressed are also important for clinical trials in other settings. After discussing general topics, the book focuses on aspects of early and late phase clinical trials. It also explores personalized medicine, including biomarker-based clinical trials, adaptive clinical trial designs, and dynamic treatment regimes. "The chapters on endpoints and safety are a must read for anyone working in this field. And for statisticians involved in the design of cancer trials, the diverse options of design and sample size calculations are well covered." "This book provides a comprehensive summary of common controversial issues frequently encountered in oncology trials. Individual issues are addressed by well-known statisticians from academic institutions, regulatory, and government agencies and pharmaceutical industry. In summary, this is an excellent book covering commonly encountered controversial issues for cancer clinical trials. It can be an excellent resource for statisticians working in oncology drug development." Stephen L. George, Ph.D., is professor emeritus of biostatistics in the Department of Biostatistics and Bioinformatics at the Duke University School of Medicine. For more than 20 years, he was director of biostatistics in the Duke Comprehensive Cancer Center and director of the Statistical Center of the Cancer and Leukemia Group B (CALGB). He has been closely involved in the design, conduct, and analysis of cancer clinical trials and other research projects in cancer throughout his career. He has served on and chaired data monitoring committees for treatment and prevention trials in cancer and other diseases. Dr. George is a fellow of the American Statistical Association and the Society for Clinical Trials. He also served as treasurer and member of the executive committee of the International Biometric Society, president of the Society for Clinical Trials, and biostatistician for the Oncologic Drugs Advisory Committee of the U.S. FDA. Xiaofei Wang, Ph.D., is an associate professor of biostatistics and bioinformatics at the Duke University School of Medicine, a member of Duke Cancer Institute (DCI), and the director of statistics for the Alliance Statistics and Data Center (Alliance SDC). He has been involved in the design and analysis of cancer clinical trials and translational studies and served on special emphasis panels for NIH and FDA grants. His methodology research focuses on the development of novel designs and methods for biomarker-integrated clinical studies and methods for analyzing patient data from multiple sources. He obtained his Ph.D. in biostatistics from the University of North Carolina at Chapel Hill. Herbert Pang, Ph.D., is an assistant professor in the School of Public Health, Li Ka Shing Faculty of Medicine (LKSFM) at the University of Hong Kong. Dr. Pang also holds an adjunct faculty position in the Department of Biostatistics and Bioinformatics at Duke University. He has been involved in the design, monitoring, and analysis of cancer clinical trials, translational, and big data-omics research in cancer for CALGB, Alliance SDC, DCI, and LKSFM. He has served on the editorial board of the Journal of Clinical Oncology and has received several honors, including the U.S. Chinese Anti-Cancer Association-Asian Fund for Cancer Research Scholar Award. He obtained his Ph.D. in biostatistics from Yale University and B.A. in mathematics and computer science from the University of Oxford.